2014 is the year of being content. In practice this will mean making do with what we have, saving some money that would have otherwise been spent frivolously, learning more about budgeting, skipping trips to target or ikea "just because." If we are honest, those random trips just to get out of the house rarely end well. But that isn't the true heart of this challenge. In September of last year, I heard Lara Casey speak at The Influence Conference in Indianapolis. You can learn more about Lara's challenge here as well as Nancy Ray's challenge. I was intrigued, even told a friend that I think sometimes I shop to buy approval of others. But then I quickly put this idea on a back burner. I didn't really want to give up shopping. Was I crazy? 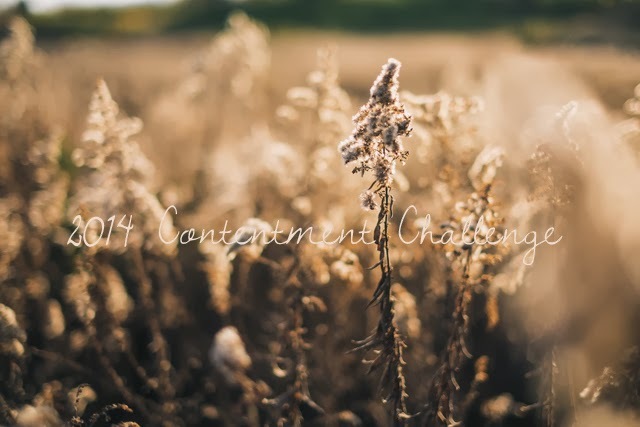 When speaking to friends about the idea of a contentment challenge, it felt like a confession. I shop. A lot. I shop with emotions, late at night and in abundance. My shopping is usually an outlet at the end of a rough day or worse, out of boredom. Deep analysis isn't needed to evaluate the situation nor do I think that I am alone in this habit of spending. As December rolled around, with the encouragement of my friend Lena, I began talking to friends and family about this challenge. My goal was to understand finances better, have open and sound communications with Mark about money, and most importantly, turn to scripture instead of spending in times of weakness. I nearly finished writing this post during my blogging hiatus in January. But things changed. The absence of shopping (and browsing) gave room for growth and change, and my world got flipped a bit. God isn't just teaching me how to be a better steward of my finances. God is teaching me about my heart. He is showing me areas of weakness, tendencies towards anger. I was prepared to control what I was going to be learning this year and in six short weeks have been reminded that I am not in control. As the challenge continues throughout the year, I will be sharing what I am learning, what God is teaching me and how this is working practically. For now, here are some details, written out mostly for accountability...and so I don't try to wiggle my way out of this. Prepare your heart, organize your closet, and make any necessary purchases that you might need during these months or plan for them. This turned into me restocking my underwear drawer (much needed post-pregnancy!) and getting rid of a lot of clothes, a process that began last summer. It was important for me to see what I had in my closet, and know that I had options that fit and worked well for me. I tried on most of my clothes and if it wasn't right on the first try, I put it in a pile to consign. Getting rid of clothes has been a huge step towards buying less. Make a list of what you will purchase. I did this in conversation with Mark, we will still buy the blurb books of our year, I will continue to do the Costco shopping, but stick to the perimeter of the store and my list, other household needs or business needs will be purchased in unison. This sin't about me checking in or getting approval from Mark, but having conversations about want vs. need, an important skill for me to learn. I won't be buying clothes for the boys -- I have stock piles to last us years (see notes on shopping above!) but as needs come up, this will be another conversation with Mark. Food, items for basic living and experiences are permissible and will still be primarily purchased by me. Unsubscribe from monthly programs. I love mail almost as much as shopping, so I spent December unsubscribing from monthly box clubs. Focus on minimizing and simplifying. I want to use this time to assess what we have and continually look to how we might be able to sell or give stuff away. Nancy stresses the importance of actively pursuing something -- since my challenge is for the whole year, I will dive more into what these areas are in my monthly goals. Finally, I love what Lara has to say here: "Gifts are okay! Remember the heart of this. It’s not about rules. If someone gives you a new dress or piece of decor during that time, receive it graciously. If you need to buy someone else a gift, by all means, do so. The point is to learn more of ourselves and the Lord. Necessities are okay! If you lose your glasses, buy a new pair. Just don’t start justifying new purchases for items that you already have. (“I really NEED this bathing suit, even though there are 8 in my closet already.”) Actively pursue something good that helps to replace your tendency to buy stuff as a source of comfort. Something that points you back to what matters most." Love this- I am going through a study right now of Jen Hatmaker's book, Seven. Through this, I too, purged a lot from my closet (and household items too). It has made me think more carefully when purchasing items too. I need a little more (okay, a lot more restraint for purchasing clothes for my daughter) But I am learning am getting there!! Look forward to hearing more about your challenge. Seven is on my list to read. But I have quite a list of books ahead of it right now. Isn't it amazing how purging reduces the urge to shop? Thanks for your sweet encouragement. I've noticed myself buying a lot I don't need and I want to stop! I've been trying to purge throughout the winter and want to continue reevaluating what I need in my space and in my closet and donating or throwing out things I don't need. This is such a hard lesson to learn, especially in our culture, but I think it's so critical. And if you want an accountability partner, holler! Its such a slippery slope...especially the target dollar spot! I would love your accountability girl! My family has recently gone from 10 years of 1 income with a stay-at-home-thrifting-saving-not spending-scraping to get by at times-mom to 2 incomes. All of a sudden we have all of this 'extra' money and it is hard to not want to buy it ALL, just because we can now! But when I look around at all of the things we already have, more than we could ever possibly need, more than some have in a lifetime, it makes me want to be content. And it makes me want to show my children contentment in this 'must-have-right-now' society we live in. Thanks Shannon! Carri, we have been in the same boat! I find I really need to actualize where the money should be going. Is it saving for a house, a vacation, or paying off debt -- that has to be at the forefront in order to keep from nickel and dime-ing myself and my family! That is part of what drew me to this challenge. I don't want to max my "spending" budget. I want to change my habits. Being content is an entirely different challenge, and yet the two are so closely intertwined, right? What a wonderful post, Shannanigans! I missed you while you were on hiatus. You've given me a lot to think about! I always know its you by the "Shannanigans!" But would you ever have guessed?